The Republic of Liberia celebrates its Independence Day on July 26. This public holiday commemorates the country's independence from the American Colonization Society in 1847. Liberia is a West African state established by freed African-American slaves. In 1816, Robert Finley founded the American Colonization Society that focused on the so-called “repatriation” of free blacks. The first ship with 88 former slaves departed New York in early 1820. The American Colonization Society agents helped the emigrants found a first settlement in West Africa. The first years were very tough for the settlers. People died from yellow fever and in armed conflicts with the native Africans, who resisted the expansion of the American colony. Nevertheless, during the first decade some 2,600 African Americans arrived in Liberia. The colony continued to grow and expand. Initially, Liberia was governed by white ACS agents, but in 1842 Joseph Jenkins Roberts was appointed as the colony's first black governor. Jenkins wanted to declare the independence of Liberia without cutting ties with the ACS. In 1846, a referendum was held, in which Liberians voted for independence. 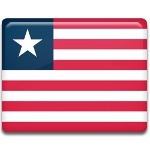 The independence of Liberia was declared in July 26, 1847.